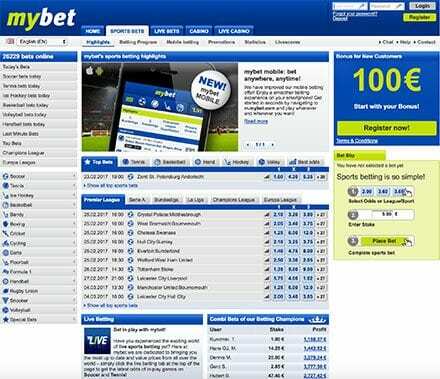 BettingPlanet recommends that you do not sign up with MyBet, on account of news published on the site on August 16, 2018, which details the bookmaker’s coming insolvency. Please use caution before betting with the company. In operation since 2002, Mybet.com is a leading online wagering operator that services punters from all over Europe and the United Kingdom. It claims to offer as many as 14,000 unique betting markets every week, covering everything from the major Euro football divisions to niche sports such as bandy and floorball. An oft-overlooked facet of good online bookies is the ease and simplicity of their registration processes. Mybet ticks all the boxes in that regard. To sign up, go to the www.Mybet.com homepage and tap one of the many and highly visible ‘Register Now’ links. Enter your basic information, verify your email address, then head to the cashier to add some funds to your new betting account and start punting. It should take no longer than two minutes or so from start to finish. While you make your first deposit, you can also opt in to Mybet’s exclusive welcome bonus for new players. The bookie will match your first deposit with up to $100 in bonus cash, meaning you can start betting with up to $200 in credits despite buying only half that amount. One of the first things you will notice about the Mybet wagering hub (located under the ‘Sports Bets’ tab in the top menu) is that it is free of clutter and dead simple to navigate. Much of that is down to the absence of horse racing and greyhound services, which opens up a lot of space in which to champion popular sporting categories. For in-play betting options on games in progress, open the ‘Live Bets’ tab. The centre of the homepage is devoted to upcoming events. The ‘Top Bets’ and ‘Best Odds’ tab shows Mybet’s feature markets and a few specials, but you can scroll through the tabs to check out the odds for basketball, handball, hockey, tennis and more. Below that is an entire display devoted to football betting markets from the English Premier League, the Bundesliga, La Liga, Serie A and major tournaments such as the UEFA Champions League. The left-hand menu is the heart of the Mybet site, from where you can navigate to any and all available betting markets by sport. Above the list of categories is a selection of quick links to popular upcoming markets and special features. With a layout this straightforward, it is almost impossible not to find what you are looking for. When it comes to placing wagers, Mybet works much like any other online bookie. Find your market, click the odds you want, enter your cash stake and confirm. The virtual bet slip allows you to combine single selections into multi bets and systems in an instant. Smartphones and tablets are now the devices of choice for punters all over the world. Mybet understands this and has worked hard to build a mobile betting interface that offers the same level of simplicity, convenience and ease-of-use as its desktop site. You don’t miss a beat on the mobile site. Every Mybet market is available and easy to find, including live betting options. Upgraded software makes for a smoother experience and seamless navigation to all corners of the bookie. The Mybet mobile sports betting site is compatible with all popular browsers for phones and tabs, including Apple Safari, Google Chrome, Microsoft Edge and Mozilla Firefox. Although it maintain fewer categories than other sports betting sites, Mybet.com offers a great spread of markets and highly competitive odds in each. It also runs a ‘Specialty Bets’ section for popular cultural events such as the Academy Awards, the Ballon d’Or and the ever-entertaining field of US politics. Mybet is licensed with both the Malta Gaming Authority and the Gambling Commission of Great Britain – two of the most well-regarded regulatory bodies for online betting and casino gaming services. The company is also certified by GamCare, which only approves operators that meet the highest player protection and anti-fraud standards. Comodo Secure 128-bit SSL encryptions ensure that all data and transactions are safe from malicious third parties. As is the case at all the best bookies, the customer is king at Mybet.com. Live chat is available seven days a week so punters can have their questions answered and needs met as quickly and efficiently as possible. There is also a dedicated online help desk packed with FAQs and feature articles that cover just about every gambling-related topic under the sun.